Both DropshipMe and AliDropship are tools for dropshipping, and they both help to automatically manage AliExpress-related processes. These plugins are fully compatible, but they should not be mixed up. Here’s the main difference between them. DropshipMe is focused on inventory. 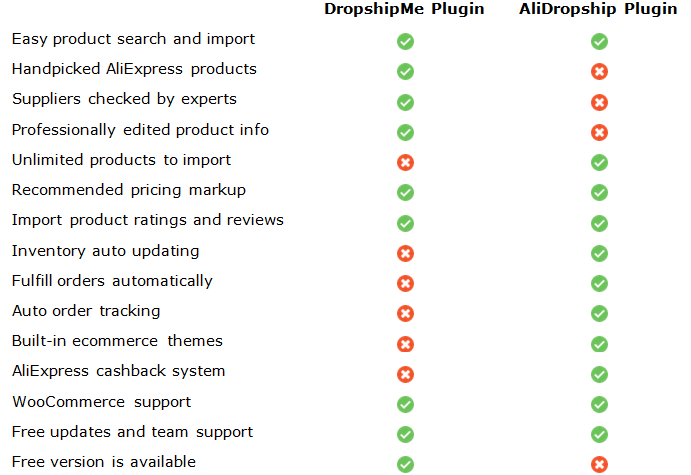 The plugin provides an access to a database of the best AliExpress products carefully selected by the DropshipMe experts. Using DropshipMe, you can be sure that our team have found the most promising niches and picked the best selling products from the most trusted suppliers. All product details including images are edited. This is why DropshipMe products are fully ready to be imported and sold in your store. So, DropshipMe plugin gets you straight to selling the winning stuff and saves your time on product editing. AliDropship plugin provides a full set of features for easy management of your dropshipping business. But as for the process of product sourcing, AliDropship simply connects your store directly to AliExpress.com website. You have to make niche research and look for promising products by yourself, as well as to edit product titles, descriptions and images. But if you are experienced enough in ecommerce, AliDropship plugin allows you to benefit from the full access to AliExpress and the unlimited number of products to import. Besides, AliDropship is not focused on product sourcing only. It provides professionally designed built-in ecommerce themes, auto-updated products’ data and stock availability, one-click orders redirection to AliExpress sellers and many other useful features to simplify dropshipper’s daily work. So, AliDropship plugin automates your dropshipping business and saves you time on the routine operations. As you can see, these plugins perfectly complement each other. From improving product sourcing process to order fulfillment and tracking, DropshipMe and AliDropship help you to start and run your own dropshipping business in the smoothest way possible and boost your profit.